In the late 1960s, Dutch officials recognized Houten - then a tiny village of a few thousand - as a potential area for major population growth. An architect named Rob Derks came up with a town plan that prioritized pedestrians and cyclists over cars. Construction began in 1978 and was finished a few years later, and when more growth was predicted in the 1990s, the area replicated itself into South Houten. Houten is anything but typical. Car traffic is primarily resigned to a “ring road” that encircles the area. Within that ring is a network of low-speed streets meant primarily for people traveling on foot or by bike (there are 80 miles of bicycle paths alone) that connect to two main intercity train stations and most of the area’s schools and shops. As a result, car trips are the minority in Houten, with an estimated 66 percent made by alternative modes. Could Houten ever work in America? From an American planning perspective, the allure of Houten is that it doesn’t push suburbanites to give up their cars or their single-family homes. It’s not just possible, it’s happening in Houten. Zie ook: A Cyclists Mecca with Lessons for Boston, Boston Globe 22.09.13. 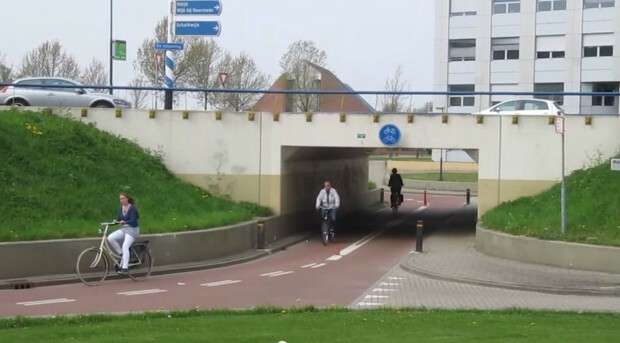 Fietsrotonde die de wijk Loerik [waar ik woon - YL] in Houten-Zuid verbindt met het noordelijk deel van Houten.